Congratulations to parents in our parish on the birth of their children. Our parish shares in your joy and we are delighted to welcome your baby into the Christian family of the Church through Baptism. 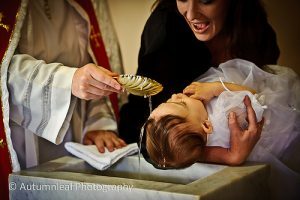 By asking for your baby’s Baptism, parents are publicly thanking God for His gift to them and they make a commitment to bring up their child in the Christian faith. We will help you carry out your decision by giving you our wholehearted support. (i) Parents can provisionally book the date for their child’s Baptism through the Parish Office. (Please note: Baptisms are limited to six in Ashbourne Church for any one ceremony, or two in Donaghmore Church.) Baptisms can only proceed when parents have completed the Pre-baptism Programme. (ii) The Baptism Registration Form can be downloaded from the parish website. This form must be returned to the Parish Office before attending the Pre-baptism Programme in the parish. (iii) Parents living outside of Ashbourne-Donaghmore Parish who wish to return to Ashbourne/Donaghmore for their child’s Baptism are very welcome. In such cases, parents are required to provide a letter from their parish of residence permitting the baptism to take place outside of the parish where they live. Parents can complete pre-baptism preparation for their child in the parish where they are living and the permission letter from the parish should confirm this has been completed. (iv) Visiting priests are welcome to officiate at baptisms in our parish. The same requirements—(i)-(iii) – apply to parents in these circumstances. Under diocesan safeguarding regulations, visiting ministers are required to present a valid celebret before officiating at the ceremony. Further details about baptisms are available on the parish website or from the Parish Office.